This morning we returned from our skiing trip to France. We stayed in Hotel Aujon in Flaine, in the Grand Massif. We had a very nice week, although the first few days we had a lot of snow. Because of that, a lot of pistes and lifts were closed. As the weather got better, more pistes were opened, and by the end of the week, we had skied most of the 265 kilometers of piste. Nice detail about the village of Flaine: the site was not discovered until 1959! In 1968 the resort was officially opened. This morning we returned from our wintersport holiday in Brixen, Austria. We had a great week, did a lot of skiing, met some nice people in our hotel, and took a few hours of private skiing lessons. Unfortunately, the weather wasn’t very good. Snow (almost) every day, misty up in the mountains, so very difficult skiing conditions. But that didn’t stop us, of course. Apart from two or three lifts, we used every single lift in the area. See here for the card. The area is very nice, and pretty large with about 250 kilometers of piste and over 90 lifts. Yesterday, our last skiing day, we met up with a girlfriend of ours (and her brother) who arrived with the same bus, that we took back home that evening! And they brought some great weather with them. Our last day was perfect, sunny – we even had lunch outside – and a lot of fun with the four of us. On a side note, just before we left last week, we booked our honeymoon. We’re going to Greece for two weeks. When? Well, after our wedding of course. The date? May 20, just like those two zillion other people! Copycats! 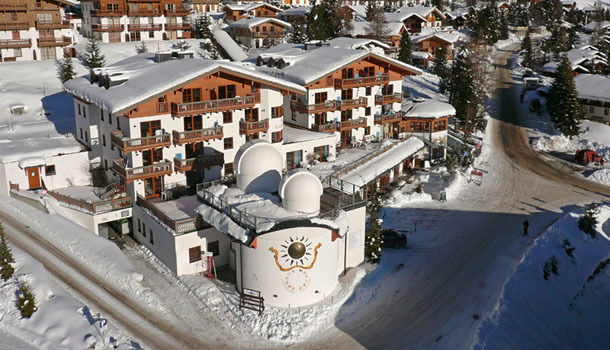 This afternoon, we will leave on our skiing trip to Brixen im Thale, Austria. We are very much looking forward to it! According to the website, there’s two meters of snow in the mountains, so that’s good. Now let’s hope for some nice weather. Check out the live webcams on the site now and again, maybe you’ll see us slide by. So, this weblog will be rather quiet next week, but you will definitely hear more about Brixen when we’re back! See you in 10 days! Last Saturday I returned from my skiing holiday. With a couple of friends I went to Oz-en-Oisans, near Alpe d’Huez, only a few kilometers from where my girlfriend and I stayed this summer. It was great fun, and very nice to see what it looks like in winter. I’ve been to the same places and have taken photographs on the same spots as I did then. Unfortunately, the weather hasn’t been very good all the time, we had a couple of snow storms, but luckily also a few very beautiful days. On Tuesday we celebrated my birthday with a very nice dinner in a restaurant in Les Deux Alpes. Update: The photos are available on my photo gallery. I was on a skiing trip to Italy! The weather was perfect, the countryside was magnificent, the pistes were beautiful… In one word: wow! Unfortunately, it’s back to work now! I learned on New Year’s Eve that a couple of my friends, with whom I went skiing last year, had planned their skiing holiday for this year, independently of each other, to the same place, in the same week. So, I decided I’d also arrange something there and then, and today, I got the confirmation from the hotel… I’m going to Selva Gardena, Italy in a few weeks! And I’m very much looking forward to it! Update: If you have the correct username and password, you can check out the photos here.